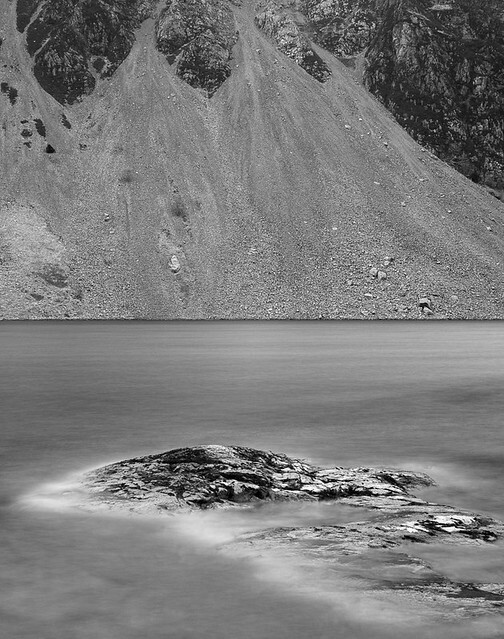 On the first morning of my 121 workshop with Paul Gallagher in The Lake District, Paul was keen to establish my camera technique and the typical settings I used. He was not familiar with the Olympus OMD EM5, as he used a Nikon D800E for his digital work, although his preferred system of choice is medium format 5 x 4 Ebony film camera which I was to see in all it’s glory a few days later. 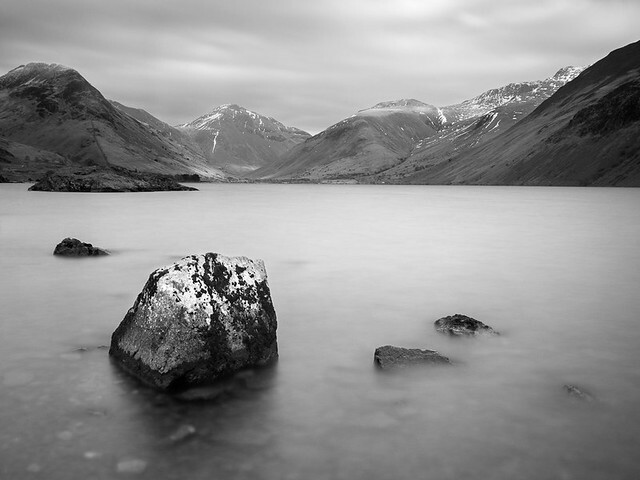 We decided to drive to Wastwater and Wasdale Head. I explained that for landscape work I would use the lowest ISO setting available. In the case of the EM5 this was ISO 200. I would also use Aperture Priority. This way the shutter speed would be automatically selected by the camera. I explained that by using ‘live view’ on the OMD, I would preview the image by showing a ‘shadow and highlights’ warning; flashing blue for underexposed areas and flashing orange for overexposed areas or blown highlights. I would then use the exposure compensation dial to make any adjustments in order to balance the exposure. If the dynamic range of the shot was too great for the camera sensor, then it might require the use of a neutral density graduated filter to balance the exposure of say a bright sky with a dark foreground. I told him I would tend to rely upon the camera’s auto focus, rarely resorting to manual focus. Believing this was a tried and tested way of taking landscape photographs I was a little taken aback when Paul suggested that it would be much easier to use manual settings for the exposure and to always focus manually. He went on to explain that by setting the aperture to say f11 or f16 to maximise the depth of field, the shutter speed could be adjusted to obtain the optimum exposure setting using the histogram as a guide. He was fully in favour of exposing to the right, but suggested that the histogram should not be right on the point of clipping the highlights, as this would leave no room for finer adjustments when it came to post processing. This made perfect sense to me and the exposure compensation dial would no longer be needed. If the histogram was not acceptable, a quick change to the shutter speed would bring about the desired result. Manual focusing is very straightforward with the EM5. Again in using live view, the instant the focus ring was turned on the lens, the screen would magnify the area of view by a factor of 5x. The amount of magnification can be changed in the settings menu. Using the arrow keys on the back of the camera it was easy to select an area of the composition where pin sharp focusing was critical. This would normally be a subject in the foreground. Having preselected a small aperture opening the depth of field should ensure that the background at infinity would also be in sharp focus. With the camera on the tripod I used the 2 second timer function so that I could press the shutter button and eliminate any camera movement which would spoil the image. Further I turned off the in camera Image Stabilisation as this can ‘fight’ the lack of movement of a camera mounted on a tripod and try and ‘compensate’ for movement when none is actually present. Don’t ask me how or why, or for a technical explanation, just turn the IS off if using a tripod. Paul was less concerned about setting the aperture to the optimum opening for the lens, which in the case of some my lenses would be f5.6, as this would rarely give the desired depth of field. Don’t worry about using a much smaller aperture he said. It’s more important that all parts of the image are in focus, even if the lens was not at its very sharpest aperture setting. Again this advise made perfect sense, so I was already benefitting from his knowledge and expertise and it was still only day one. With photography over for the day but before heading back to our hotel in Keswick, I visited one of the smallest churches in England – St Olaf in Wasdale Head. 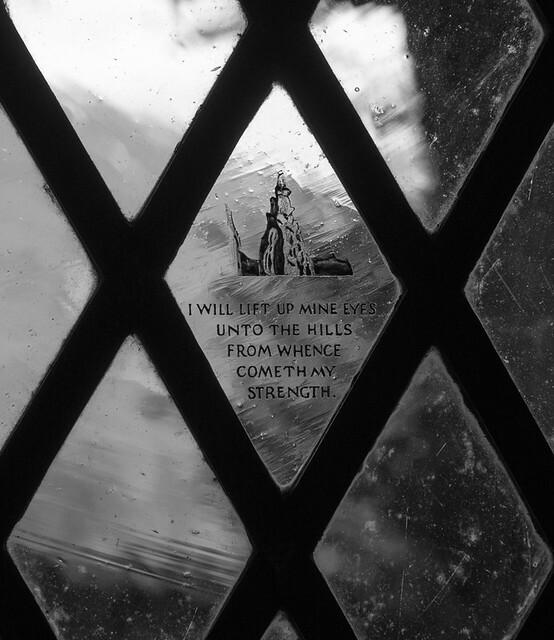 This church holds special memories for me and in particular the inscription in the glass of a leaded light window. The words are taken from Psalm 121 and the etching is of Napes Needle on Great Gable. A fitting memorial to all mountaineers and climbers who have visited this beautiful part of the world.